Have you heard about the BIG IDEA that inspired Hannah Strom-Martin and I to publish Futuredaze? Well…here’s your chance. John Scalzi is featuring Futuredaze as one of the BIG IDEA posts on his blog. This is pretty darned exciting for us. So, please go check it out and leave a comment to let us know that you were there. You should also check out the rest of his site. Scalzi is a fantastic science fiction writer who I highly recommend to anyone looking for a good dose of SF. Remember, if you have any questions for us or questions about the anthology, feel free to add them to the comments section of our Big Idea post. Also, we’d love to have you help to boost the signal on our BIG IDEA post for Futuredaze. Futuredaze has been reviewed by Tangent Online. You can read the entire review on Tangent’s website where they give a mini review for each short story within the anthology. However, for your convenience, here’s the summary statement for Futuredaze as a whole, which pleases me greatly. Visit Tangent Online to read the Futuredaze (short story) reviews. Reading Teen Hosts Futuredaze — Don’t miss the contest! Come check it out. Let us know what you think. 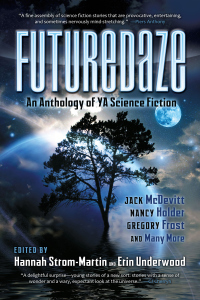 AND don’t forget to enter the contest to win your copy of Futuredaze!